These custom made axes are not the Decorative types that are so readily available! These are the real tools you want to have if you need to take down a charging line of Knights on horseback. Each weapon is individually hand crafted to order by some of the best arms crafters in Europe. They are able to study in depth original pieces from museums and private collections in Europe. Old-World craftsmanship ensures attention to detail. Each piece is fully functional and battle ready and they will perform just as well as the originals. They have hardwood Ash poles available; however due to shipping issues, the heads come unmounted. Extreme care should always be taken. Shipping time is between 4 to 12 weeks. Whether you desire museum quality display pieces or battle ready arms we feel confident you can find it here. 16th century German Halberd with evolutionary form, heavy medial ridged leaf shaped spear point, slightly concave edged axe blade and angled back spike. 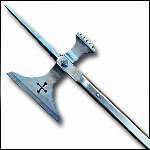 This German Halberd (Head Only) replicates a circa 1500 A.D. museum piece. 1/4 inch steel, 1/8 inch thick langets. Halberd with Functional Axe Head is hand forged from steel, wooden pole available. Halberd with a Functional Axe Head is hand forged from steel, wooden pole available. Approximately 105'' Overall length. This Halberd has a Functional Axe Head and is hand forged from steel, wooden pole available. Halberd with Functional Axe Head is hand forged from steel, wooden pole available. Approximately 77" Overall length. Functional Halberd Axe Head is hand forged from steel. Approximately 77" Overall length. This halberd has been professionally distressed (antiqued) to appear as an original 16th century halberd. Functional Axe Head is hand forged from steel, wooden pole available. Our Halberd has a Functional Axe Head and is hand forged from steel, wooden pole available. Approximately 77" Overall length. Functional Halberd Axe Head is hand forged from steel with your choice of finishes. Wooden pole is available. Approximately 78 inches Overall length. Functional Axe Head is hand forged from steel and polished, wooden pole available. Approximately 77" Overall length. This Pole Axe replicates a 15th. - early 16th. century museum piece. 1/4 inch steel, 1/8 inch thick langets. The Pole Axe is supplied sharp but may be modified for re-enactment use. Ash shafts are available separately. This Swiss Halberd replicates a 16th century museum piece. The head is crafted in 1/4" steel, with 1/8" thick langets. The head is supplied semi-edged but it may be readily modified for re-enactment use.